Having a hard time getting beat sales? If so, you might wanna go over this list and rethink your approach..
You might be doing something wrong. The list below may sting a bit but try to keep a constructive perspective on this while reading. It may just help you make a sale. People who fall under this category approach the game backwards and will immediately have a hard time trying to sell beats online. Just as soon as they come in the front door they are pushed out the back. They are the type to abuse social networks by spamming people with"check out my music" links and then wonder why no one wants to give them a listen. You may have came across this type before.. you may even be this type.... if this is you.... Shame on you. Tip: Try reaching out to others in a genuine way that isn't focused on you. You may be surprised at the response you get. Not sure how to get started? Check out my post here. Lets be real. Not everyone wants trap beats or "type" beats. Just because a sound is "in" doesn't mean that everyone wants it. 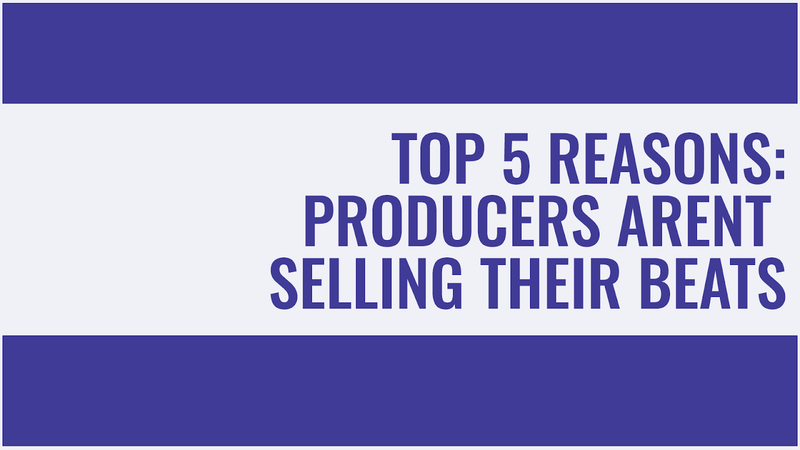 This is not to say that money cant be made selling these type of beats, but nowadays, they are popular and they are everywhere - so only the best of the best might stand a chance competing in that market. You making trap beats and not getting any sales???? What that means is to try focusing on a sub-genre style that feels natural to you and work on becoming the "go to" guy for that particular sound. Once you get known as "that dude that makes xyz beats" you'll have an edge in the market. When that happens - the sales will come. I hate to break it to you but the chances of JAY-Z's limo breaking down outside your house are probably about as good [or bad] as getting struck by lightning - so realize that at some point you will probably have to get out of your bedroom studio and connect with cats in the physical world if you want to make a name for yourself. They've got some awesome stuff for the low. Yes, I'm talking to you "Mr. 20 beats for a dollar" and you "Mr. I charge $10,000 a beat". In today's current market you both are shooting yourselves in the foot. Its time to be real with yourself and price your beats competitively. Tip: Too low and too high can both kill your sales opportunities so take some time to visit some of the popular beat selling sites and try your best to aim for that sweet spot, alright? No Producer wants to hear this but the truth must be told! Some cats think too much of their music (and themselves) and the truth is that their beats just aren't ready for the market yet. It could be bad mixing, poor sound choices or any number of things..
Whatever it is - You are not ready. No worries tho - grind it out. You'll get better in time. And don't compare yourself to others in a bad way. There are always gonna be the few cats that will get lucky and manage to sell beats online that aren't quite ready yet. But you Mr. / Ms. Producer, are in this for the long haul, so you will work hard all day and night perfecting your craft before you put it out there for sale.. right? If you are not sure what to charge for your beats..
You probably aren't ready to sell beats online.